Siddu /Sidu is steamed bread from Himachal Pradesh a beautiful state in India. A Sidu is a stuffed yeast bread made from wheat flour. Eat Siddu with Desi Ghee “Clarified Butter”, Dal or with Pudina Chutney/Mint Chutney. Where can you eat Siddu? Traditionally you will find Siddu in Mandi, Kullu, Manali, Rohru and Shimla. Why am I talking of Siddu? This month for #Breadbakers Mayuri has asked us to make bread with seeds. I must thank her for making me think and think, after a lot of different loaves of bread I researched I have settled for Siddu, a Himachali bread that is either steamed or baked. I have steamed here as it is so hot and humid that I have no desire to switch on the oven. By the time I step out of the kitchen, I am baked. Coming back to Siddu which happens to be a bread made from wheat flour and yeast. The mixture needs to rise before you can make Sidu. In Himachal Pradesh where it is cold, the dough is left to rise for about 4 to 5 hours. Mine rose in half an hour something I did not expect as I had reduced the yeast to ½ the given measures and boy was I in a hurry to get my stuffing ready. The cuisine of Himachal Pradesh is based on curds and ghee or clarified butter. Since fresh vegetables are not easily available they use a lot of lentils, seeds to make their food. Do try this amazing cuisine I have tried making chana madra in the past. I have one more dish from here lined up somewhere at the end of the month so do keep an eye open to see more of this amazing cuisine. The Siddu reminded me of Steamed Kadbu ( I have fried them)that Amma made only they were sweet and she did not use yeast. Then there is Sweet Potato Ravioli or Kanga che Nevri that Goans make but again that is sweet. The measure for the yeast and flour here are what are used traditionally. I reduced the yeast as it is too hot here but feel that I should have gone with the given measures the crumb would have been better. The number of servings you get will depend on the size of the Siddu. I got about 15 but then I varied the sizes. Also, please remember that the dough expands as you steam it. Leave space of about 1 inch in-between. In a big bowl mix, the wheat flour and yeast add a little sugar and salt. Knead well for at least 15 minutes. Leave the dough covered in a well-oiled vessel to rise for 4-5 hours or till double. In the mixer jar coarsely grind the green peas, corn, green chillies, walnuts and the rest of the ingredients except the paneer. Transfer to a bowl of mashed paneer and salt mix well. Make small balls of the dough dip in flour and roll out to a small disc. Traditionally this is done by hand. The size of the disc can be about the 5 centimetres. Spread about 2 tablespoons of the stuffing in the centre of the disc leave about 1/2 cm at the edge. Fold the dough in half fold the edge back over on itself then pinch the edges to firmly seal. 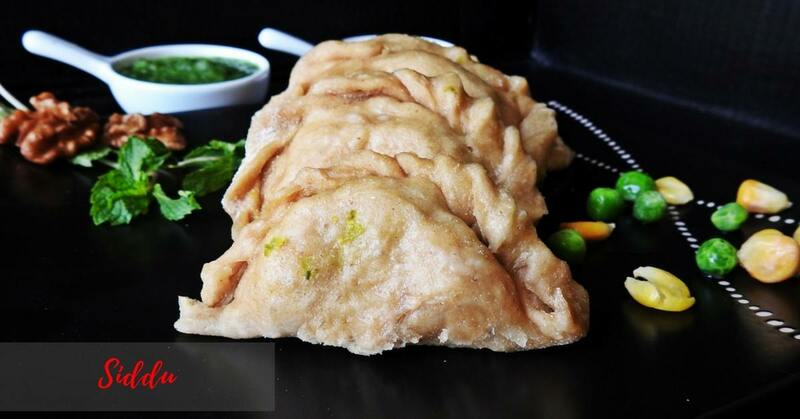 Steam the siddu a lightly greased steamer or bake in the oven at about 180Deg Centigrade and cook for 15 minutes. Enjoy hot with Chutney or Desi Ghee!! Siddu /Sidu is steamed bread from Himachal Pradesh a beautiful state in India. In a big bowl mix the wheat flour and yeast add a little sugar and salt. Leave the dough covered in a well oiled vessel to rise for 4-5 hours or till double. In the mixer jar grind coarsely the green peas, green chillies, walnuts and the rest of the ingredients except the paneer. 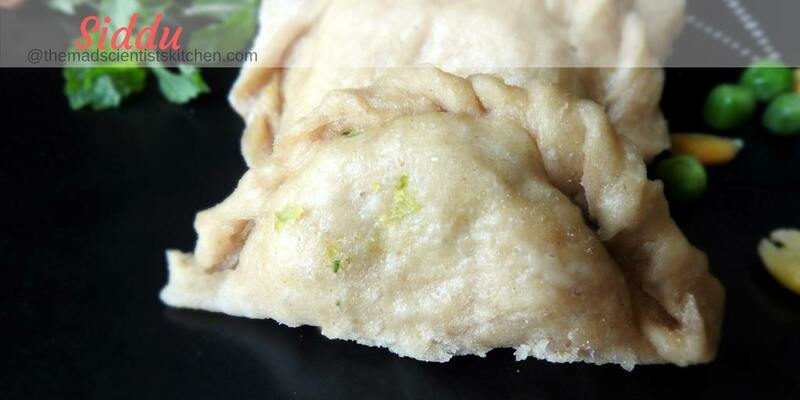 Make small balls of the dough dip in flour and roll out to a small disc. Traditionally this is done by hand. The size of the disc can be about the 5 centimeters. This is a new bread to me and now a must try! Oh wow, this looks amazing. I’ve never heard of this stuffed bread before but it sounds delicious. This looks delicious, and the idea of steaming it will impart a nice flavour to it with the paneer filling in it. Healthy share. This is a totally new bread for me. Siddu looks absolutely delicious and love that it is baked. Lovely find Archana. I love learning of new recipes. Thanks for sharing. Aww so sweet of you. I made siddu a couple months back and loved the steamed snack. I used a savory walnut filling and shaped them round. Love you filling, must try it next time I make siddus. Mayuri, thanks. 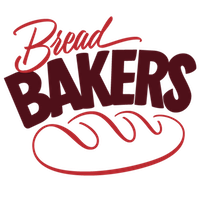 I loved the fact that I had to think of the bread I wanted to make. Thanks for the nudge. As for the stuffing will check the one you have tried. Must have been delicious. What a unique recipe Archana! Fabulous share! Recipe and the information about it are both an enjoyable read. I have to try making Sidu soon. Thanks, Sandhya your feedback will be much awaited. A very innovative recipe looks amazingly delish, will definitely try them out 🙂 Thanks for the recipe! 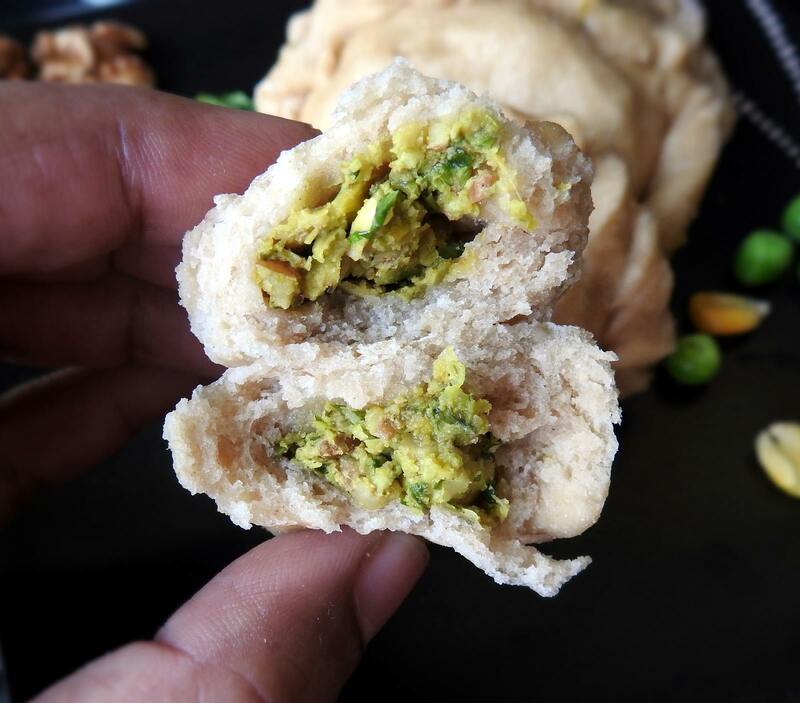 This steamed bread from Himachal Pradesh sounds absolutely flavorful with panner stuffing ! You have shaped them beautifully di ! The steamed bread from Himachal Pradesh sounds so flavorful with the paneer stuffing ! You have shaped it beautifully too di ! 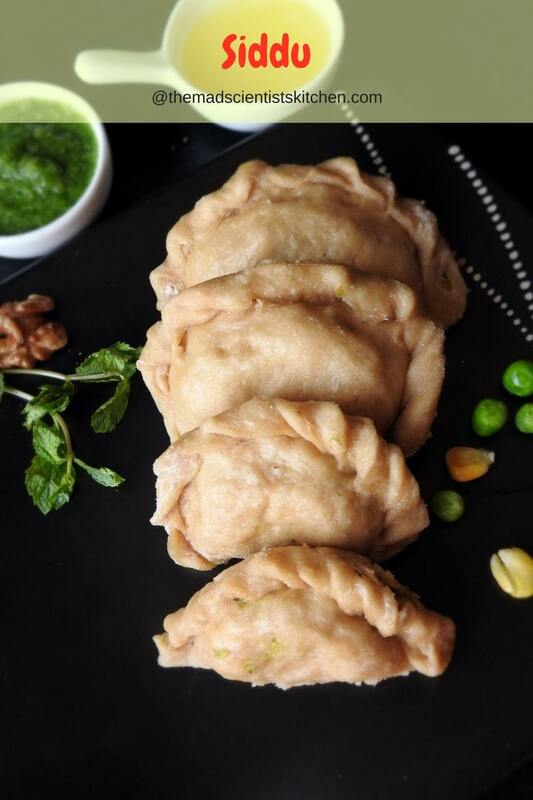 The steamed bread from Himachal Pradesh sounds flavorful with the planner stuffing ! You have shaped them beautifully too di ! Wow,, lovely steamed bread with stuffing.. looks so yummy. I recently crossed this steamed bread, and loved it. The stuffing sounds absolutely yum Archana. This is a new bread to me..it sounds so interesting and yummy recipe, I love traditional recipes and lovely write, good to know about it..Thanks for this beautiful share ???? I can do sweet stuffing too. Sure why not? Go ahead. I make sure I visit your blog when I’m done with all my house chores so that I can read and enjoy your post in peace. 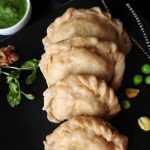 Because there is always so much to learn from you – just like these delicious turnovers that I could never have imagined to steam ever! Such beautiful texture and so healthy compared to the deep fried versions of similar stuffed breads elsewhere in the world. Once again thank you for a great idea! ???? Thank you, dear, you are the best. I have tried steamed sweetbreads, I bet this spicy version must have tasted as delicious as the sweet ones. Looks awesome, it’s new to me, do need to try sometime. These look so delicious and tasty, and the good fact that they are steamed, what a delicious bread! This steamed bread from Himachal looks so healthy and yum as it is perfect.I am sure it tastes delish.